Each frame is .1 seconds apart. Kosuke Kitajima's time for this event was a world-record 2:09.42. 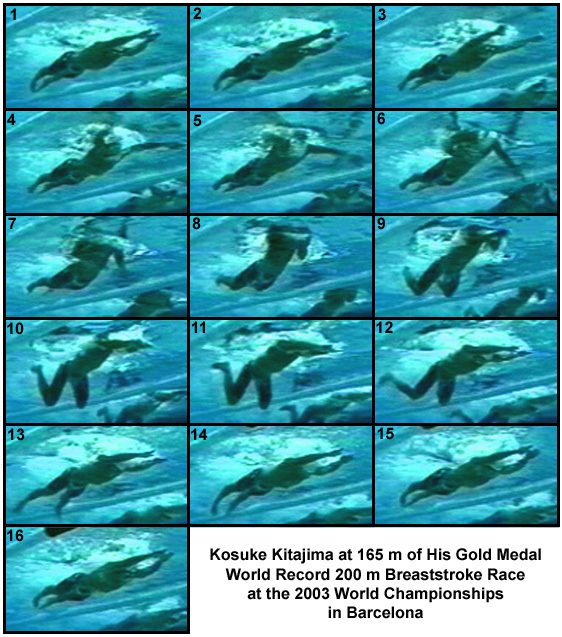 Frame #1: This frame depicts a hallmark of Kosuke Kitajima's breaststroke style. He is perfectly streamlined. Each stroke in this 200-m race is completed exactly to streamline before the next stroke begins. As well as all parts of the body being fully "stretched", his eyes look down to the pool bottom. Frame #2: The stroke commences with the arms being moved outward. There is no hand pitch to develop a "lift" force from any sculling action. The head begins to rise, but the remainder of the swimmer holds streamline. Frame #3: The hands are wider than the shoulders, the head continues to rise (drag turbulence begins to form off the nose and chin), and the remainder of the swimmer holds streamline. Frame #4: The arms and hands are rapidly repositioned to exert propulsive forces. The elbows bend, the upper arms medially rotate, and the wrists flex to allow the hands to push backward and down. The head continues to rise. Frame #5: The arms are in a powerful position. Strong abduction of the upper arms allows the whole arms to function as propulsive surfaces. Minor extra elbow flexion occurs, which causes the hands to move backward and downward as well as slightly inward. The shoulders begin to rise. However, exceptional flexibility in the thoracic area of the spine facilitates the remainder of the swimmer to continue in streamline while the head emerges preparatory to breathing. The downward component of the propulsive arm movement provides the force to raise the head and shoulders. Frame #6: Once the brief propulsive phase is completed, the hands begin to slice inward and upward with rapid elbow flexion and adduction of the upper arm. It should be noted that the arm movement phase of this stroke is exceptionally fast. Minimizing time in unproductive positions also minimizes detrimental resistance. The "fast" arms also require the head and shoulder actions involved in breathing to begin very early in the arm movement, something that does not happen in an older traditional model of swimming this stroke. Frame #7: Breathing occurs. The hands are close to being together. They have risen upward in continuation of the previous frame's movement. The lower trunk and legs remain streamlined. Frame #8: The hands come together and break the surface. The wisdom of this fast largely vertical movement has to be questioned. The legs begin to be drawn to the buttocks as an initiation of the kicking action. Frame #9: After a brief period out of the water, the hands reenter as they are thrust forward and down. The back begins to straighten to bring the shoulders and arms back into a streamlined position. Frame #10: The speed of the arm movement and the breathing action causes considerable momentum in the "forward" part of the swimmer. Since it involves considerable and possibly too much vertical movement, it causes the swimmer's head, shoulders, and arms to move forward and down. A large turbulent pocket of drag resistance is clearly seen on top of the arms. The legs continue to be drawn forward causing the knees to drop as the hips are flexed. If the hips were not flexed, the power of the eventual kick would be lessened. Frame #11: The torso is close to full streamline. The head is tucked between the arms. The arms are straight but down [in this writer's opinion this is because of recovering the hands out of the water in the early phase of arm recovery. If that were not done, perhaps the arms would be more horizontal than in the position displayed in this frame.] The kick is about to commence with the knees comfortably apart. Frame #12: The swimmer emphasizes streamline of the trunk, head, and arms. The hands have parted slightly from the overlapping recovery position displayed in the previous frame. The head is tucked well down between the upper arms and the eyes look directly at the pool bottom. The kick is wide and direct. It does not sweep out and around. Frame #13: The forward part of the swimmer is streamlined. The arms have risen slightly and the hands continue a minor separation. The feet are very wide and terminate a direct kick. It should be noted that this kicking motion is indicative of "modern" breaststroke swimming. The head, shoulders, and arm actions are completed before the kick occurs. That allows the kick to propel a swimmer with those non-propulsive body parts in positions of minimum resistance. Frame #14: Most of the swimmer is in rigid streamline as the legs are drawn together, which remain ever so slightly down as a consequential counterbalancing action to the downward arm movement that occurred earlier. Frame #15: The feet rise to achieve full streamline as the hands come together. Frame #16: The discipline of this swimmer is evidenced in this frame. His position is almost the same as that of Frame #15 with the exception being an ever so slightly upward adjusted position of the feet to produce perfect streamline. The swimmer's head has also tilted forward slightly as can be seen by the turbulence coming off the eyebrows and nose. The attention to streamline detail and discipline of completing a full streamlined stroke are notable features of Kosuke Kitajima's movement pattern. The speed with which the arm and body actions are completed is also notable because the quick return to streamline maximizes the result of the kick. The value in recovering the arms over the water early in the recovery phase has to be questioned. It appears to introduce a large vertical force component that costs the swimmer during the remainder of the arm recovery (Frames #10 through #12) and also affects the latter position of the feet in the kick.